New Delhi, January 31: “Government's focus lies on issues of national importance and finding solutions to problems of the people. The country expects from all of us to perform our duties as Parliamentarians in a positive manner and we must deliver to the expectations of the people”, said Shri Narendra Modi while addressing floor leaders of parties in the Rajya Sabha and Lok Sabha here on Thursday ahead of the budget session. 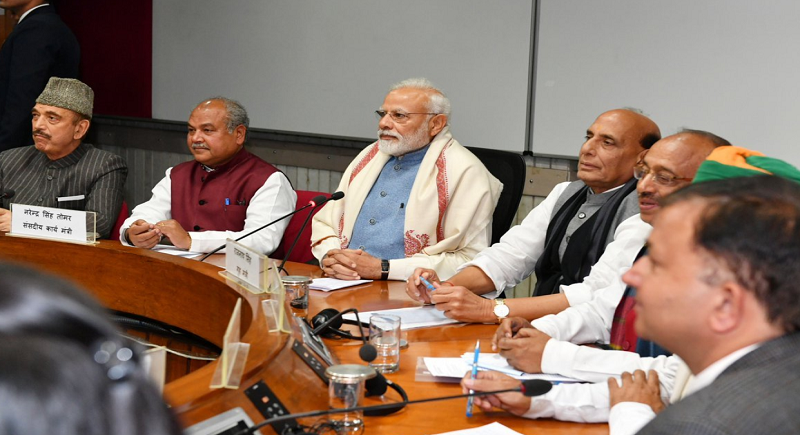 After the President’s address in the national capital today, an all party meeting was called by Vice President M Venkhaiah Naidu in the presence of Home Minister Rajnath Singh, Vijay Goel and Arjun Ram Meghwal. A host of issues were brought up by the leaders of parties during the meeting. The Prime Minister assured all leaders that issues raised by them would be taken into consideration by the Government and given due importance. Narendra Singh Tomar, Minister of Parliamentary Affairs informed about the commencement of the Interim Budget Session. He also said that the Session will provide a total of 10 sittings spread over a period of 14 days. The Session will mainly be devoted to the Financial Business relating to Interim Budget for 2019. However, three bills to replace Ordinances of the Muslim Women (Protection of Rights on Marriage) Ordinance, 2019; the Indian Medical Council (Amendment) Ordinance, 2019 and the Companies (Amendment) Ordinance, 2019 are scheduled to be passed during the Interim Budget Session, 2019 itself.